Bounty Hunters premieres on Sky One this October, and TVGuide.co.uk has reviewed episode one of the series to give you a taste of what to expect. Sky One’s brand new comedy drama series brings TV lovers the best of both worlds. Bounty Hunters has all the excitement of a drug cartel, Breaking Bad-style series show, wrapped up with all the appeal of a British comedy show. The first episode begins in Brooklyn, New York, where the badass Nina is hunting down criminals as the track “It’s Bigger Than Hip Hop” by Dead Prez booms. At this point, you might think you have a pretty good idea of what kind of show this is going to be, but the juxtaposition between this and the next scene is truly fantastic. The viewer is then transported to Cambridge, where Flemish textiles student Barnaby is trying to fit his box-sized smart car into the world’s smallest parking space. It’s the mixing of these two polar opposite worlds that makes Bounty Hunters such an original and funny series. The show has a brilliant cast. 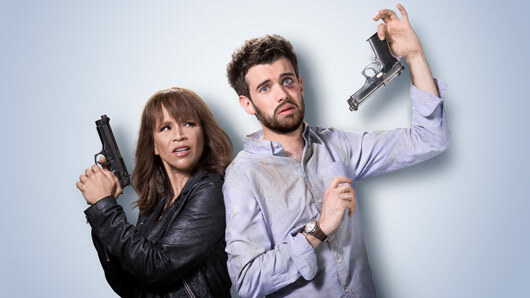 Oscar nominee Rosie Perez is fiery and dripping with cool confidence as Nina, while Jack Whitehall’s comic timing is as on point as always as the painfully straight-cut Barnaby. It is the dynamic between these two actors, though, that works so well. The characters couldn’t be more different and yet they develop a relationship that’s both ridiculously funny and really quite endearing. The series also stars Robert Lindsay, Charity Wakefield, Sophie Thompson, Bradley James, Doc Brown and Olga Merediz. It doesn’t matter whether you’re a fan of comedy or action, British series or American, Bounty Hunters has something that will appeal to everyone. Bounty Hunters premieres Wednesday 25 October at 10pm on Sky One.